Sorry the DP charts from 4 weeks ago do not reproduce now in the above post, but you can locate those "jaws" back in early July on the new DP charts above. The market went sideways a few days then dropped 70 point vs. SPX. Let me emphasize: Short term I see a similar set up here- though perhaps 40-50 SPX points would contain it at this point, imho. 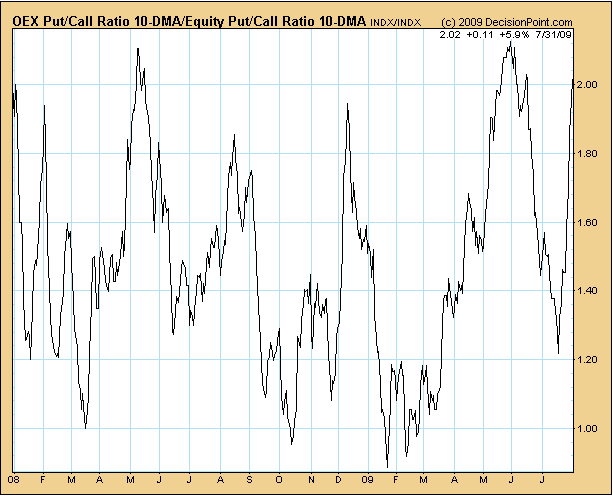 The ratio of oex to equity 10 day readings was then 2.0. Today it is 2.016. Just a comment on short term sentiment. IT and LT is a whole 'nother animal, and that post is not ready yet. im with ya all the way. This is going to get velly velly interesting. Whoever is on the wrong side of this trade will be in substantial pain for quite awhile. Just eyeballing the rest of the indicators in the last days of June (haven't even looked at 2007), the current situation looks different technically. There was a CCI that could barely get up to the median point before falling back, an MACD that already had had a triple divergence, and was about to fall through the 0 line, and the SPX itself also rallying up to the median line from below, before falling to test the bottom BB band. Just doesn't look ripe for the fall you're suggesting, except for that p/c ratio. Looks more like the beginnings of one, sort of a bearish 'green shoots', or grass roots, or bear sprouts, or whatever they're calling it these days. Edited by dowdeva, 31 July 2009 - 11:17 PM. OK, so now I'm confused. I just took a look at your post again, and in you quote early July as the preceding jaws of death scenario, but in the chart you point to early June, in which case, cancel my last thought. Sorry, my bad. It's "aloha Friday" and mai tai's are just a buck 'til 10 PM in Waikiki. I meant Jun 6, 2009. Edited by IYB, 31 July 2009 - 11:38 PM. Edited by IYB, 01 August 2009 - 12:03 AM. The symbol for 10 day OEX PCR is !10PCROEX and the symbol for 10 day equity PCR is !10PCREQU. If you enter !10PCROEX:!10PCREQU in the symbol box on DP or stockcharts you should get that chart. Looking back at the chart from 2003, it looks like in a bull market this number can stay upwards of 2 for a while. Edited by Will, 01 August 2009 - 12:08 AM. Thanks again Will. And I agree that bull market rules are different than bear market rules - context is everything as I always say. How do you get the symbols for each indicator? I've been wanting to get the individual charts for the McO volume readings for various indicators, and to run then against 6 ema's. Can you add 6ema (for example) to the DP charts? Looks like my weekend just filled up with a whole new line of research. Edited by IYB, 01 August 2009 - 12:16 AM. Once you have the symbol you are looking for, using the ChartTool you draw EMA or any other indicators.